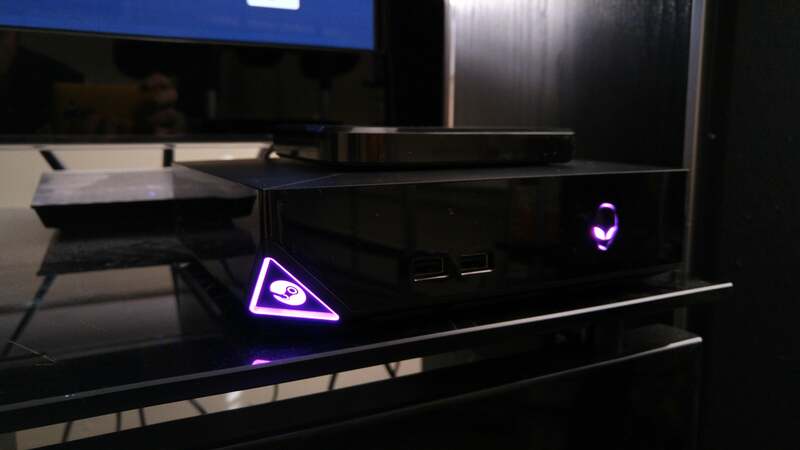 The first Steam Machines are finally here, and made by Alienware. We go hands-on. Of course, that was nearly two years ago. And while Alienware’s machine hasn’t changed much in the intervening years, literally everything else has. Let’s dig into what the flagship Steam Machine has to offer. NOTE: This is a discussion about Alienware’s hardware, specifically. For a critique of the overall Steam Machine concept, look here. Also be sure to read my in-depth reviews of the Steam Link and Steam Controller. In terms of aesthetics, it’s easy to see why Valve is pushing the Alienware Steam Machine so hard. Regardless of the hardware inside and the SteamOS experience—we’ll get to those aspects later—the Alienware Steam Machine looks console-esque. Actually, it looks better than either of the two current-gen consoles. Alienware’s machine is very safe, very conservative, all glossy-black planes adorned only with illuminated (with the option to disable) Alienware and Steam logos. I liked it when I first saw it, and I like it now sitting underneath my TV. It’s an understated, no-frills approach to the living room PC. Take a picture of a black box on top of a black box on top of a black counter. That makes sense. Measuring 8 inches square and 2.5 inches high, the Alienware Steam Machine has about half the footprint of the comically-oversized Xbox One, but packs more performance. 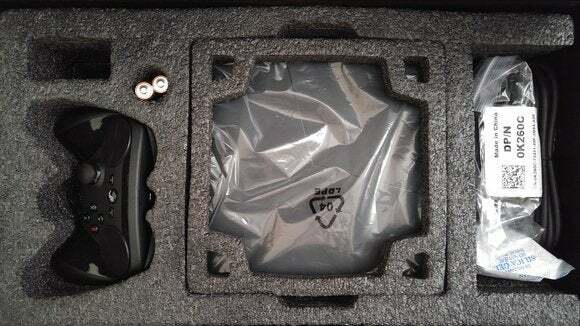 The power brick is also much more reasonable, sporting the slim profile that most high-end gaming laptops use nowadays. In other words, the Alienware Steam Machine fits into an entertainment center even better than its “competitors.” It’s still a PC, but aren’t consoles just highly specialized PCs nowadays too? The front of the Alienware box features two USB 2.0 slots, while the back features two USB 3.0 ports, the power connection, HDMI In and Out, Optical Audio Out, and a Gigabit ethernet port. Oh, and don’t forget the USB port in the bottom of the machine. That’s where Alienware hides the Steam Controller’s connection dongle. It’s a great idea—most people probably won’t even realize at first that the Steam Controller has a dongle, unless they bought a second one separately. Unfortunately I’ve had some issues where the Steam Controller says it’s having “Connection Issues” and needs better line-of-sight even when I’m only ten feet away, leading to me removing the dongle from its hidden alcove and sticking it in the front of the machine. We’ll let you know if that problem goes away, as it seems to have started clearing up after a recent controller firmware update. “Yeah, yeah, yeah. It looks great. That was never in question. Talk about SteamOS.” Okay, Mr. Contrived Segue, I’ll oblige. SteamOS. Call it Valve’s middle finger to Windows, call it a “gaming-focused” operating system, call it pure lunacy—I don’t care. 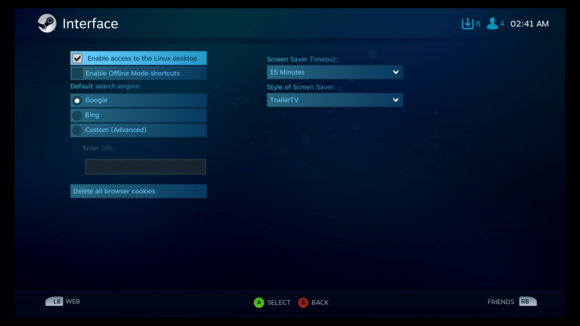 It’s Valve’s custom Linux-based OS, designed solely for and around living room gaming. 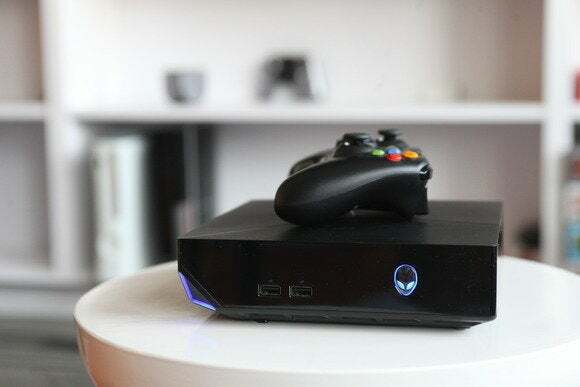 Alienware did a pretty great job of transforming Windows into a ten-foot UI last year when it released the “It’s-totally-not-the-Steam-Machine” version of this box, the Alienware Alpha. But there’s no getting around it: Windows just wasn’t designed for that sort of experience. SteamOS feels like a much more unified environment. Everything is geared toward the Steam Controller, everything works right out of the box. Valve’s even built possibly the most intuitive controller-based typing interface I’ve seen, taking advantage of the Steam Controller’s two haptic pads. 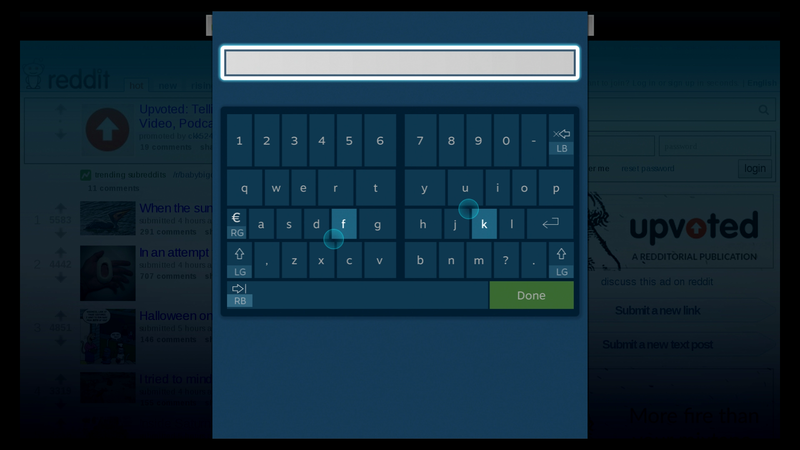 You can use each half of the keyboard individually, and then pull the corresponding Left or Right trigger to input letters. It works great. Valve’s significantly updated Big Picture in the past few months, and all the important bits you’d need to play PC games in the living room are here—the store, your library, and community content (mods, broadcasts, et cetera). Bringing PC gaming into the living room comes with a few tradeoffs, however. First, games. 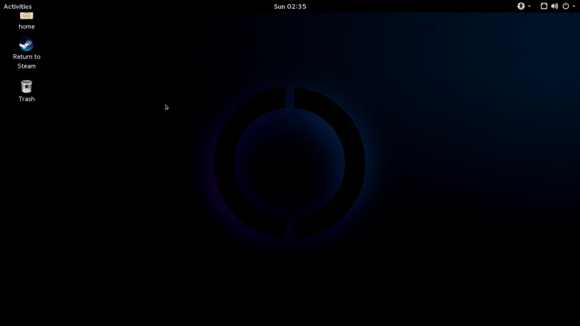 This is a Linux-based OS. Those of you who already game on Linux/Mac will understand what that means, but uh...how do I put this nicely for Windows gamers? Your beautiful, extensive Steam library? The one you’ve painstakingly put together for years? Expect it to be cut in half when you turn on your Alienware Steam Machine—or any Steam Machine, for that matter. Personally I went from 700+ games down to around 215, despite the strides that Steam for Linux has been making. The rest can be streamed over your network from a Windows-based gaming PC, preferably from a wired-in PC to your wired-in Steam Machine—that’s where the Gigabit ethernet jack comes in handy. 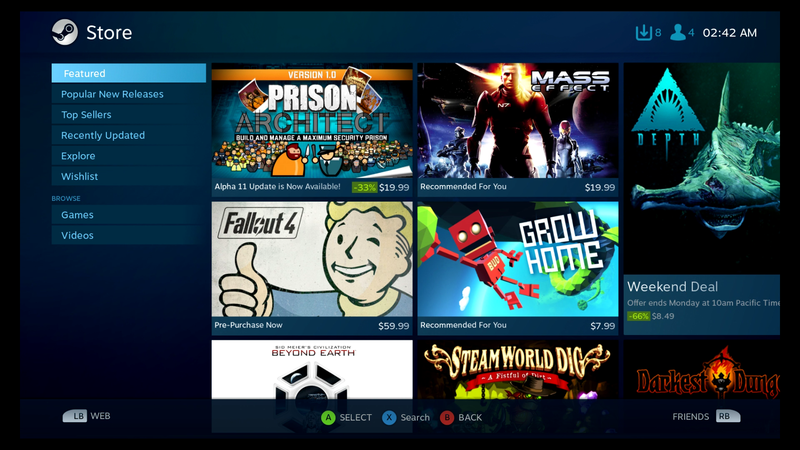 But if you wanted to stream games, you could just go with the much cheaper Steam Link. Also, the machine is surprisingly locked-down, considering Valve built it partially in response to fears of Windows becoming a walled garden. One issue I find particularly galling: Accessing your files and saved games is needlessly obfuscated. It is, as far as I can tell, impossible to reach the SteamApps folder without root access, and saved games are also (again, as far as I can tell) hidden behind that wall. This makes it even more frustrating that Valve hasn’t mandated the use of Steam Cloud, or made it so all Steam Machine saves are uploaded to some cloud repository at the very least. In the past, having two or more computers was an edge-case. Now it’s a scenario Valve directly encourages. I shouldn’t be forced to finish a game on my TV just because I started it there. I want the freedom to move back and forth between my PC all the time, for every game. And don’t expect the media options you get from other consoles. Despite a note on Alienware’s site saying “You’ll be able to stream TV shows and movies,” there’s no easy-access Netflix app, no Hulu or HBO Go or Prime Video or whatever. It’s got a web browser but that’s a hack solution at best, not official support. Two more annoyances: You can’t turn the machine on from the controller, like a console. You have to boot it by physically pressing the power button on the front. And changing users causes the whole machine to restart, which I think is a limitation of the way SteamOS is built. SteamOS has grown significantly in the past two years though, and I expect we’ll see even more rapid iteration once Steam Machines are in the hands of a vocal and demanding public. I’ve got the highest-end Alienware model at my apartment, which retails for $750 and packs an i7-4765T Quad Core processor clocked at 3GHz, 8GB of DDR3 RAM, a 1TB 7200rpm hard drive, and a custom-built Nvidia GPU that’s equivalent to an 860M. The $450 base model isn’t much different, except it packs an i3-4130T Dual Core chip, 4GB of RAM, and a 500GB hard drive. The power of an 860M...oof. The sad reality is that this machine was supposed to release last year, before Valve’s last-minute delay for Steam Machine. Alienware’s Steam Machine would’ve been on the low end of mid-tier even at the time, and another year hasn’t done it any favors. The Alienware Alpha (pictured) already felt a bit underpowered. Now the hardware’s another eleven months older. It’s cheap, though. I’ll give it that. There’s a solid amount of computer here for $450, especially—though I’d recommend people at least consider the $550 version, which still leans on an i3 processor but at least bumps the RAM to 8GB, which is practically mandatory for modern gaming. Ideally you’re looking at the $650 i5-equipped model, which nets you a quad-core processor. Or you could buy the basic model and upgrade it yourself—the processor, RAM, and hard drive are all replaceable. Sadly, the GPU—the most important bit for gaming, and likely the biggest bottleneck moving forward—is not. It’s soldered down, and it’s what will eventually turn your Alienware Steam Machine into a paperweight. 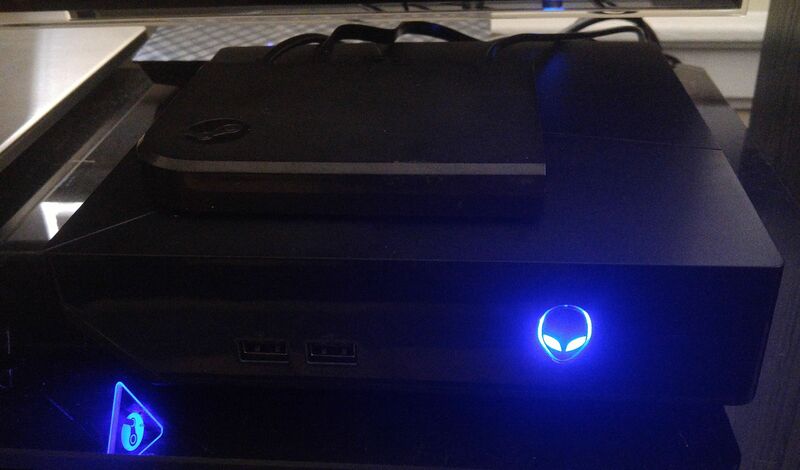 The good news: The Alienware Steam Machine is more powerful than consoles. The less-good news: It is barely more powerful than consoles. The not-good news: It won’t be more powerful for long. That’s a “lie,” insofar as the Alienware Steam Machine’s hardware will always be more powerful than the current-gen consoles in terms of raw specs. But Steam Machines still haven’t overcome one important issue: PC hardware lifespans are not nearly as long as those for consoles. Expect a lot of “Medium” in your future. Last year I bought an Xbox One. I expect to use it for the next seven years, and I will be able to play every single game released for it during that time. The Alienware Steam Machine? 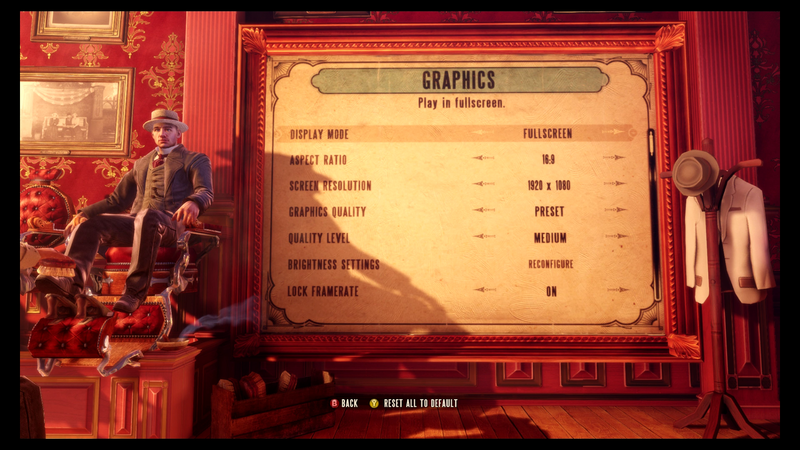 It’s already limited to playing modern games at 1920x1080 on Medium settings—I played BioShock Infinite, Metro 2033 Redux, and Spec Ops: The Line with those presets, and still saw the occasional frame rate dip. And none of those games are cutting-edge releases; they were simply the shiniest Linux-capable games I owned. In two or three years? 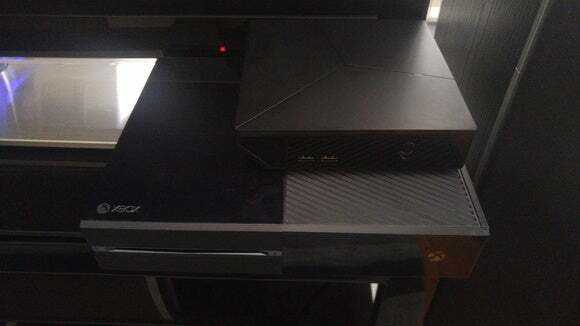 Expect the Alienware Steam Machine to be limited to low settings on big-budget games. Or you can stream the games from your more capable primary rig, but then why spend $450-plus on a full-fledged Steam Machine when you could just opt for the $50 Steam Link? I’m not saying the Alienware Steam Machine is devoid of benefits. It hits 1080p natively, which the Xbox One still has problems doing consistently. It’s whisper-quiet, which is also more than I can say of the Xbox One. It’s plugged directly into your TV, so there’s no chance of significant input lag or image compression like you might see while streaming. And if your primary PC rig isn’t that great (or is a Mac)? Well, the Alienware Steam Machine is a surprisingly competent gaming machine for not-that-much money. It’s definitely a better investment than a gaming laptop, considering the internals are mostly identical. But it’s packing hardware that’s already a generation behind current PCs, and the gap will only grow. The Alienware Steam Machine is a solid entry-level gaming PC, sure—but one lacking the upgrade path it needs to stay viable. Editor's note: This article originally published as an impressions piece on October 16, 2015, but was updated to review status on November 10.